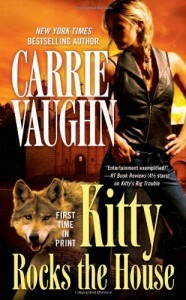 Kitty is the werewolf pack master of Denver. She and the vampire master of the city are two of the few people who stand in the way of Roman, whose Long Game to destroy humanity is gaining momentum. Even as Kitty and Rick try to make new allies, others challenge their power bases: a new werewolf is setting himself up to challenge Kitty, while a vampire Catholic priest tries to lure Rick away from Denver. I really liked how the alpha fight was resolved --Darren came at Kitty like the only thing that mattered was who was more physically powerful, but she talked her way into support from the whole pack before the physical confrontation even started. They never even had a fight, because she made it clear that he would have nothing to lead if he won. I think this is the first time I've seen a werewolf pack anywhere in urban fantasy/paranormal romance that had an alpha who wasn't particularly powerful, but did have vision and human warmth. It's a cool way of looking at what is always written in a very hierarchical, primitive structure. I was less enthused by the rest of the plot. It felt slapdash, and it didn't move the overall story forward at all. This series feels stalled, and I understand: resolving the Long Game plot is a huge undertaking, and it should involve alliance building and investigation before the big climax...but c'mon, let's get to it!